Astronomers have discovered a rare, warm, massive Jupiter-like planet orbiting a star that is rotating extremely quickly. The discovery raises puzzling questions about planet formation – neither the planet's comparatively small mass nor its large distance from its host star are expected according to current models. The observations that led to the discovery were made using the SPHERE instrument at ESO's Very Large Telescope. The article describing the results has been accepted for publication in the journal Astronomy & Astrophysics. Paraphrasing Isaac Asimov, scientific progress is announced not so much by “Eureka!” than by “Hm, this is odd!” The newly discovered planetary system HIP 65426 is a case in point: With a central star in ultrafast rotation, the absence of a gas disk one would have expected for a system 14 million years old and a comparatively light, distant planet, the system doesn't quite fit the existing models for how planetary systems come into being. There is, however, the planet HIP 65426b. Comparing the direct observations with suitable models, HIP 65426b is a warm Jupiter-like planet, with a temperature of about 1300-1600 Kelvin (1000-1300 degrees Celsius), about 1.5 times the radius of Jupiter, and between 6 and 12 times Jupiter's mass. This would make HIP 65426b a gas giant, like Jupiter, with a solid core and thick layers of (mostly hydrogen) gas. Indeed, spectral examinations using SPHERE's spectrograph indicate the presence of water vapor and reddish clouds, similar to Jupiter's. The planet is far out, orbiting its host star at 100 astronomical units (100 times the average Earth-Sun distance, and more than three times Neptune's distance from the Sun). Again, this represents various levels of oddness: Stars of the type of HIP 65426 (spectral class A2V) are expected to have about twice the mass of the Sun; it has long been assumed that such a star would have much more massive giant planets than the 6-12 Jupiter masses of HIP 65426b. 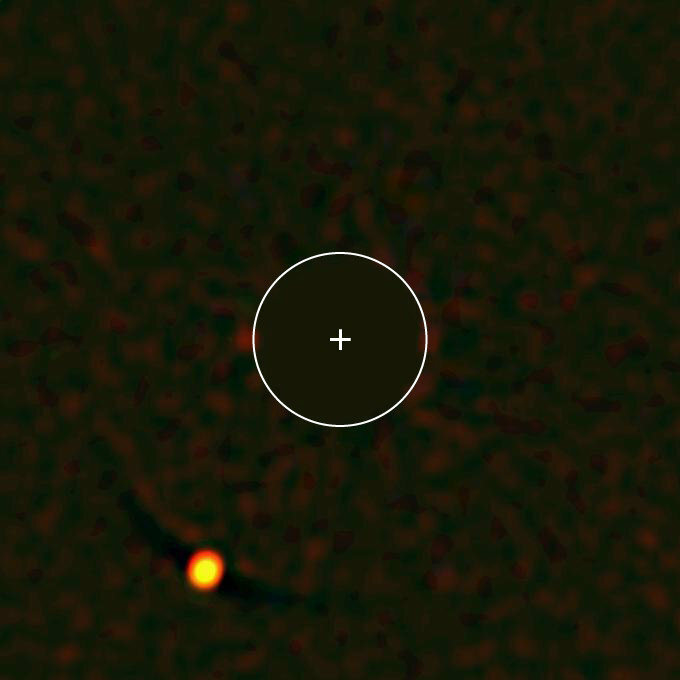 On the other hand, such giant planets would not be expected as far out as HIP 65426b.